Although the earliest Buddhist texts of the Mainstream Buddhist schools - the Nikāyas or Āgamas (4th-3rd century B.C.E.) - do not set out a systematic cosmology, many of the ideas and details of the developed cosmology of the later traditions are, in fact, present in these texts. Some of these have been borrowed and adapted from the common pool of early Indian cosmological notions indicated in, for example, the Vedic texts (1500 to 500 B.C.E.). and presented as a coherent and consistent whole, with some variation, in the exegetical Abhidharma commentaries and manuals that date from the early centuries C.E. 3 principal Abhidharma traditions are known to contemporary Buddhism and scholarship, those of the Theravāda, the Sarvāstivāda, and the Yogācāra. The Theravada or “Southern” tradition has shaped the outlook of Buddhism in Śrī Lanka and Southeast Asia. The Sarvāstivāda or “Northern” tradition fed into the Abhidharma system of the Mahāyāna school of thought known as “yoga practice” (Yogācāra) or “ideas only” (vijñapti-mātra), and their perspective on many points has passed into the traditions of East Asian and Tibetan Buddhism. The elaborate cosmology presented by these Abhidharma systems is substantially the same, differing only on points of detail. This traditional cosmology remains of relevance to the worldview of ordinary Buddhists in traditional Buddhist societies. 1. The universe has no specific creator; the sufficient cause for its existence is to be found in the Buddhist cycle of causal conditioning known as Pratītya-samutpāda (Dependent Origination). 2. There is no definite limit to the universe, either spatially or temporally. 3. The universe comprises various realms of existence that constitute a hierarchy. 4. All beings are continually reborn in the various realms in accordance with their past Karma (action); the only escape from this endless round of Rebirth, known as Saṁsāra, is the knowledge that constitutes the attainment of Nirvāṇa. The Abhidharma systems agree that Saṁsāra embraces 31 principal levels of existence, although they record slight variations in the lists of these levels. In fact, during the course of their wandering through Saṁsāra it is perhaps likely that all beings have at some time or another been born in most of these levels of existence. 1. and the formless realm (arūpa-dhātu, -loka) at the top. The realm of sensuality is inhabited by beings endowed with the 5 physical senses and with minds that are in one way or another generally occupied with the objects of the senses. and jealous gods (Asuras, which are, according to some, a separate level, but to others, a class of being subsumed under the category of either hungry ghosts or gods). Rebirth in these realms is as a result of unwholesome (akuśala) actions of body, speech, and thought (e.g., killing, taking what is not given, sexual misconduct, idle chatter, covetousness, ill will, wrong view, and untrue, harsh, or divisive speech). The happy destinies of the sensual realm comprise various increasingly pleasant forms of existence consisting of human existence and existence as a divinity or god (deva) in one of the 6 Heavens of the sense world. Rebirth in these realms is a result of wholesome (kuśala) actions of body, speech, and thought, which are opposed to unwholesome kinds of action. This consists of further Heavenly Realms (reckoned as 16, 17, or 18 in number) occupied by higher gods called Brahmās, who have consciousness but only 2 senses - sight and hearing. These are attained by stilling the mind until it becomes completely concentrated and absorbed in an object of meditation, temporarily recovering its natural brightness and purity. who are all either non-returners (spiritually advanced beings of great wisdom who are in their last birth and who will reach Enlightenment before they die) or beings who have already gained Enlightenment. All the beings of the Pure Abodes are thus in their last life before their final liberation from the round of rebirth through the attainment of Nirvāṇa. and existence is characterized by pure and rarefied forms of consciousness, once again corresponding to higher meditative attainments. At the centre of a cakravāḍa is the great world mountain, Śumeru or Meru. This is surrounded by 7 concentric rings of mountains and seas. the southern part, below the towering range of mountains called the abode of snows (Himalaya), is effectively India, the known world and the land where Buddhas arise. At the outer rim of this world disc is a ring of iron mountains holding in the ocean. in some sources these are given as 8 hot hells and 8 cold hells. An early text describes how in the Hell of Hot Embers, for example, beings are made to climb up and down trees bristling with long, red hot thorns, never dying until at last their bad karma is exhausted. The lowest of these is that of the Gods of the Four Kings of Heaven, who guard the 4 directions. On the peak of Mount Śumeru is the Heaven of the Thirty-Three Gods, which is ruled by its king, Indra or Śakra (Pāli, Sakka), while in the shadow of Mount Śumeru dwell the jealous gods called Asuras, who were expelled from the Heaven of the Thirty-Three by Indra. Above the peak is the Heaven of the Contented Gods or Tuṣita, where Buddhas-to-be, like the future Maitreya, are reborn and await the time to take birth. and it is in a remote part of this heaven that Māra, the Evil One, lives, wielding his considerable resources in order to prevent the sensual world from losing its hold on its beings. The 6 Heavens of the sense world are inhabited by gods and goddesses who, like human beings, reproduce through sexual union, though some say that in the higher heavens this union takes the form of an embrace, the holding of hands, a smile, or a mere look. The young gods and goddesses are not born from the womb, but arise instantly in the form of a 5-year-old child in the lap of the gods (Abhidharmakośa III, 69-70). Above these sense-world heavens is the Brahma World, a world of subtle and refined mind and body. Strictly, Brahmās are neither male nor female, although it seems that in appearance they resemble men. The 14th century Thai Buddhist cosmology, the 3 Worlds According to King Ruang, describes how their faces are smooth and very beautiful, a thousand times brighter than the Moon and Sun, and with only one hand they can illuminate 10 000 world systems. A Great Brahma of even the lower Brahmā heavens may rule over a thousand world systems, while Brahmās of the higher levels are said to rule over a hundred thousand. It may be that beings come to take a particular Great Brahma as creator of the world, and a Great Brahma may himself even form the idea that he is creator, but this is just the result of delusion on the part of both parties. In fact the Universe recedes upwards with one class of Great Brahma being surpassed by a further, higher class of Great Brahma. Thus the world comprises “its gods, its Māra and Brahma, this generation with its Ascetics and Brahmins, with its princes and people” (Dīgha nikāya). The Nikāya/Āgama texts sometimes talk in terms of the thousand-fold world system, the twice-thousand-fold world system, and the thrice-thousand-fold world system or trichilicosm. According to North Indian traditions, the last of these embraces a total of one billion world systems, while the southern traditions say a trillion. there is no spatial limit to the extent of world systems. World systems as a whole are not static; they themselves go through vast cycles of expansion and contraction across vast eons of time. Most frequently this contraction is brought about by the destructive force of fire, but periodically it is brought about by water and wind. This fire starts in the lower realms of the sense-sphere and, having burnt up these, it invades the form realms; but having burnt up the realms corresponding to the first Dhyāna, it stops. The realms corresponding to the 2nd, 3rd, and 4th Dhyānas and the 4 Formless Realms are thus spared destruction. But when the destruction is wreaked by water, the 3 realms corresponding to the 2nd Dhyāna are included in the general destruction. The destruction by wind invades and destroys even the realms corresponding to the 3rd Dhyāna. Only the subtle realms corresponding to the 4th Dhyāna and the 4 Formless Meditations are never subject to this universal destruction. 4. the period when the world remains expanded. Suppose there was a great mountain of rock, 7 miles across and 7 miles high, a solid mass without any cracks. At the end of every 100 years a man might brush it just once with a fine Benares cloth. That great mountain of rock would decay and come to an end sooner than even the Eon. So long is an eon. the mother’s milk drunk by each of us in the course of our long journey through Saṁsāra is greater by far than the water in the 4 great oceans (Saṁyutta nikāya ii, 180-181). Within this shifting and unstable world of time and space that is Saṁsāra, beings try to make themselves at ease. In general, beings who inhabit the lower realms of existence live shorter, more precarious, lives, while the gods live longer; at the highest realms, gods live vast expanses of time - up to 84 000 Eons. Yet the happiness that beings find or achieve cannot be true happiness, not permanently lasting, but merely a relatively longer or shorter temporary respite. Beings in the lowest hell realms experience virtually continuous pain and suffering until the results of the actions that brought them there are exhausted. but while their lives may endure for inconceivable lengths of time in human terms, they must eventually come to an end once again when the results of the actions that brought them there are exhausted. the way in which the various Realms of Existence relate rather closely to certain commonly (and not so commonly) experienced states of mind. Buddhist Cosmology is at once a map of different Realms of Existence and a description of all possible experiences. We have created it by our own karma, by our deeds, words, and thoughts motivated either by greed, hatred, and delusion or by non-attachment, friendliness, and wisdom. For, in this fathom-long body, with its mind and consciousness, said the Buddha, lies the world, its arising, its ceasing, and the way leading to its ceasing (Saṁyutta nikāya i, 62). Essentially the states of mind that give rise to unwholesome actions - strong greed, hatred, and delusion - lead to Rebirth in the unhappy destinies or realms of misfortune. while a life dominated by wilful ignorance of the consequences of one’s behaviour leads to rebirth as an animal, a brute existence ruled by the need to eat and reproduce. On the other hand, the generous, friendly, and wise impulses that give rise to wholesome actions lead to rebirth in the happy realms as a human being or in one of the 6 realms of the gods immediately above the human realm, where beings enjoy increasingly happy and carefree lives. By developing states of deep peace and contentment through the practice of calm meditation, and by developing profound wisdom through insight meditation, one is reborn as a Brahmā in a realm of pure form or formlessness, which is a reflection of those meditations. if one lives like a god, one will be reborn as a god. so, even if one is reborn in the condition of a Brahmā living 84 000 Eons, the calm and peaceful condition of one’s existence is not ultimately lasting or secure. Just as ordinary happiness is in this sense Dukkha (suffering) or unsatisfactory, so too are the lives of the Brahmā’s, even though they experience no physical or mental pain. - and the attainment of Nirvāṇa. Nirvāṇa is the unconditioned, the deathless, beyond space and time, known directly at the moment of Enlightenment. some Eons like our present are auspicious (bhadda) with a total of 5 Buddhas, of whom Gautama (Pāli, Gotama) was the 4th and Maitreya (Pāli, Metteyya) will be the 5th. Other Eons may have no Buddhas at all. (3) field of experience, which potentially extends to infinite numbers of world systems. The basic cosmology outlined above with some variation is assumed by the Mahāyāna sūtras, as well as the authors of the systematic treatises of Indian Mahāyāna Buddhist thought. However, the Mahāyāna cosmological vision increasingly expands its attention beyond “our” world system and our Buddha to include other Buddhas and their spheres of influence. Early Buddhist writings and the non-Mahāyāna schools such as the Theravāda and Sarvāstivāda emphasize the impossibility of the appearance in the world of 2 Buddhas at the same time (for how could there be 2 “bests”?). since there are innumerable trichilicosms, there can in fact be innumerable Buddhas at the same time in these different trichilicosms. Thus Mahāyāna writings tend to focus on the Universe as made up of innumerable clusters of World Systems, and each of these sets of world systems has its own series of Buddhas. Since these sets of World Systems are not absolutely closed off from each other, we even now in our part of the universe - called the Saha world - have access to the living Buddhas of other parts. It is this Buddha-field that a Bodhisattva seeks to purify through his wisdom and compassion on the long road to Buddhahood. 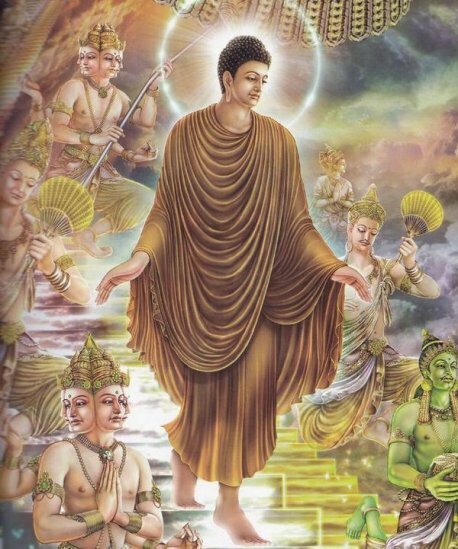 such as Sukhāvatī - the Realm of Bliss of the Buddha Amitābha/Amitāyus, where the conditions for attaining Enlightenment are particularly propitious if one can but be reborn there. But the question persists whether such Pure Lands are to be found in some far flung part of the cosmos or are here now, if we had but the heart to know it. constituted by innumerable world systems, each with its Buddha, floating in the countless oceans of a cosmic lotus, of which again the numbers are countless. This vision ends in the conception of a multiverse of worlds within worlds where the Buddha, or Buddhas, are immanent.